Russia's Tupolev Tu-95/142 Bear is without doubt the most outstanding descendent of the Boeing B-29, and if production life is any measure of success, it has outperformed its counterpart, the Boeing B-52, decisively, remaining in full rate production well into the 1990s. While the Bear is often regarded to be antiquated, it remains a highly effective cruise missile carrier, ISR and targeting platform, encompassing a much wider range of roles than the more specialised B-52 series. Given the prospect of regional operators such as China acquiring variants of the Bear, the aircraft should be of considerable interest to observers of regional capability. To better assess the strategic impact of the Tu-95/142 Bear in the regional environment APA will explore this aircraft in some detail. The design concept for the Tu-95 was a direct evolution of the 1940s Tupolev Tu-4 Bull, a cloned late build B-29, exploiting experience gained during the design of the swept wing Tu-16 Badger and the straight wing piston powered Tu-85, intended to match the B-36. 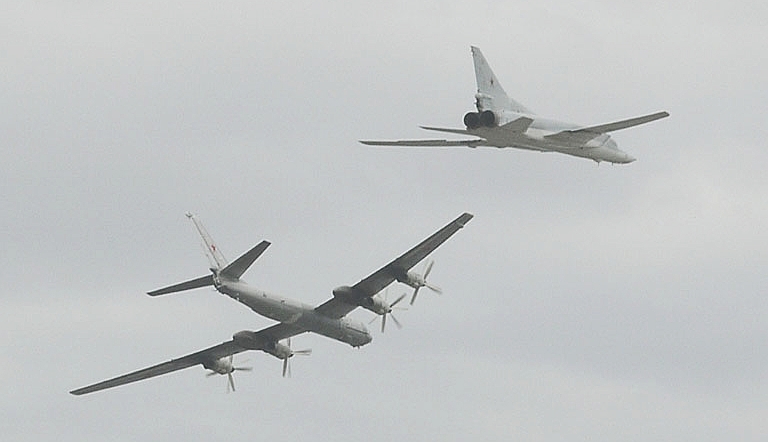 Initially two Tu-95 configurations were trialled. The 95/1 with eight TV-2F 6,250 SHP turboprops in four nacelles flew in late 1952 but was destroyed during a test flight. The 95/2, with four 12,000 SHP TV12 counter-rotating turboprops, flew in 1955 and entered production in 1956 at Kuybyshev. 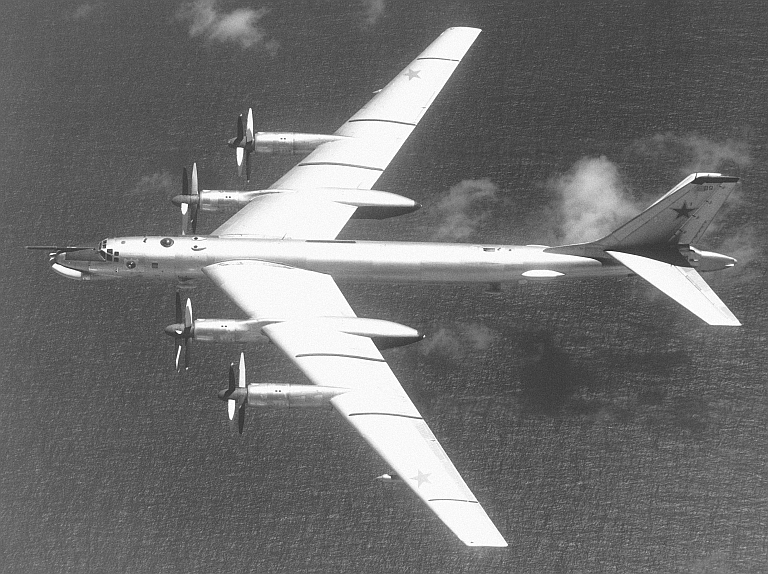 In terms of its intended role and production entry, the Tu-95 Bear is a contemporary of the US B-52. 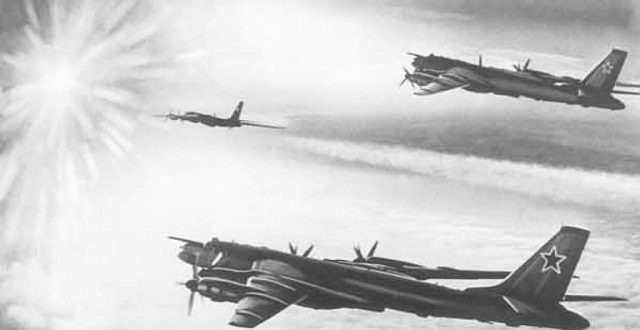 The first production variant was the Tu-95 strategic bomber, designated the Bear A. It clearly displayed its B-29 heritage with pressurised forward and aft crew compartments, internal 14 metre long bomb bay, a pair of remote controlled 23 mm gun barbettes and associated PS-48MM optical sights, a tail gunner's station, and prodigious range performance. The stepped forward fuselage, similar to the Tu-16, became a unique trademark of this generation of the Tupolev bombers - and transports. 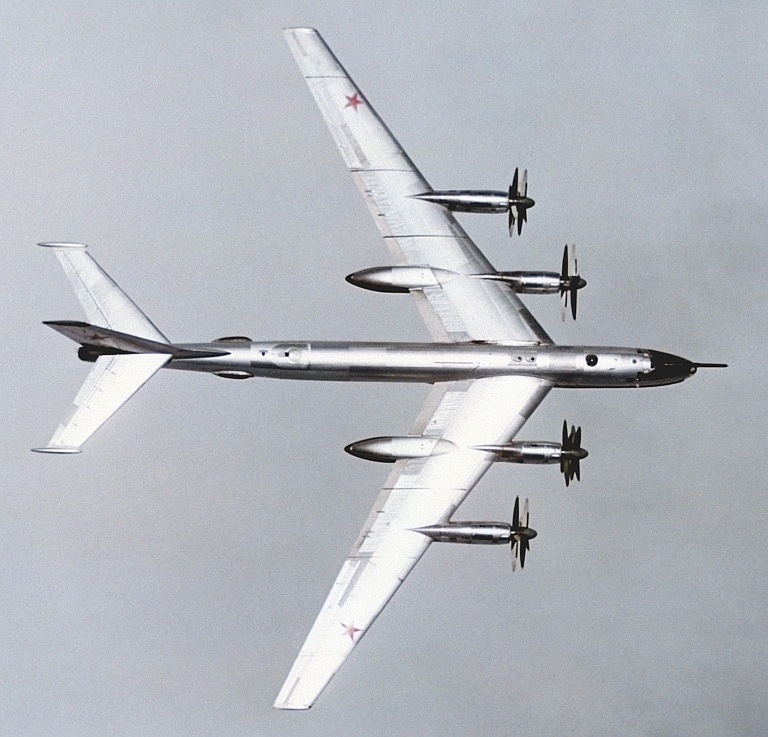 Later production Bear As were designated the Tu-95M and equipped with high performance NK-12M engines. The Tu-95V was a specialised derivative of the Bear A with a structural rebuild of the fuselage to accommodate a single 60,000 lb high yield hydrogen bomb. A Bear V dropped the sole example of the 56 Megatonne 'Tsar Bomba' in October 1961 over Novaya Zemlya, this being the highest yield nuclear weapon ever tested in the atmosphere. 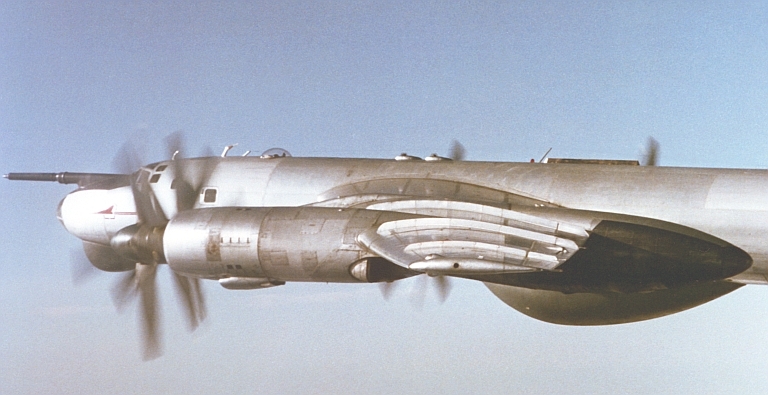 The baseline Tu-95 was equipped with a PRS-1 Argon 'Bee Hind' tail warning radar, the Tu-95M introducing the Leninets Rubin-1KV and RBP-4 Rubin 'Short Horn' attack radars. The Bear A was in concept a direct evolution of WW2 strategic bombers, achieving greater speed, altitude and range performance, and designed to defeat early turbojet interceptors. 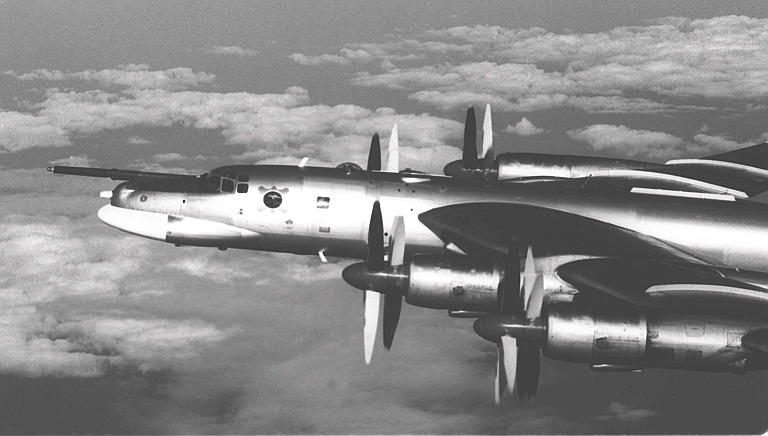 The advent of radar guided surface to air missiles during the 1950s quickly destroyed the viability of the Bear A, this leading to the Tu-95K-20 Bear B, introduced into production in 1958, and formally designated in the Russian system as the Tu-20. The Bear B was a cruise missile carrier, armed with a single 25,000 lb class Kh-20 'Komet' / AS-3 Kangaroo cruise missile, armed with an RDS-6 thermonuclear warhead. 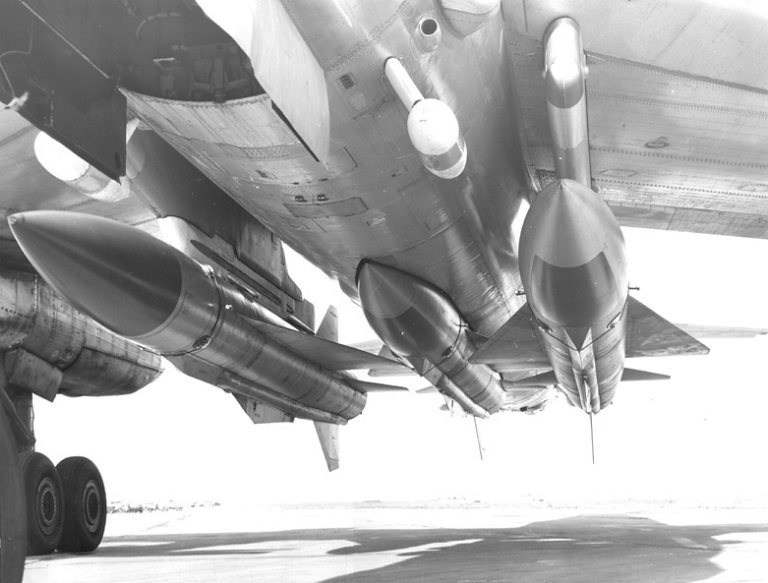 The rebuilt bomb bay incorporated a BD-206 launcher, and a fuelling system to fill the missile before launch. Improved NK-12V engines were used. The most prominent design change was the introduction of the I-band YaD A336Z Crown Drum attack and targeting radar for the Kh-20 / AS-3, in a unique nose radome, with a 3 metre wide antenna. Russian sources claim that 40 Bear Bs were built. Its primary weapon was the large Al-7F turbojet powered Raduga Kh-20 / AS-3 Kangaroo, armed with a nuclear warhead. The Kh-20 was cumbersome and disappeared from service use by the 1970s, progressively replaced with the liquid rocket powered Raduga Kh-22 Burya / AS-4 Kitchen. The next evolution of the baseline Bear B was designated the Tu-95KD, it incorporated single point refuelling, an aerial refuelling probe, and an avionic package for rendezvous with Myashischyev M-4 Bison tankers. Russian sources claim 25 were built. Tu-95KD Bear B. This was the baseline cruise missile carrier variantarmed with the large Kangaroo ASCM (US DoD). 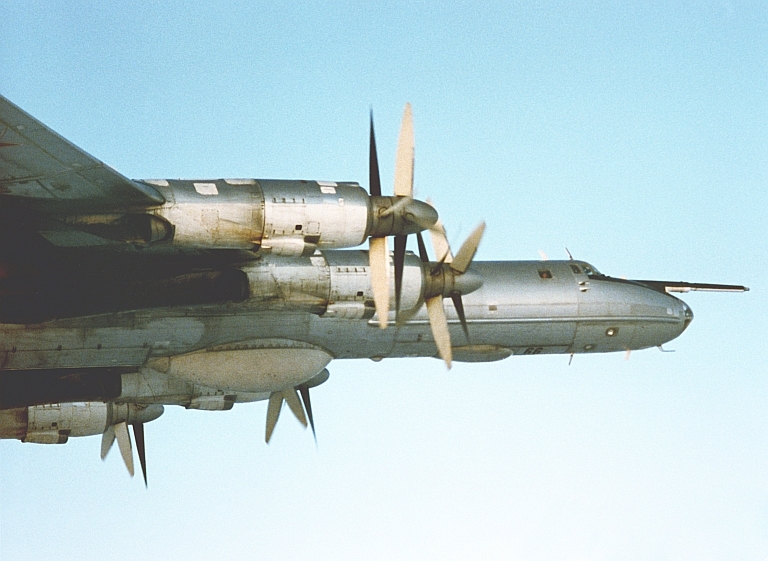 Tu-95KM Bear C. Note the aft fuselage Romb 4A ESM blisters (US DoD). 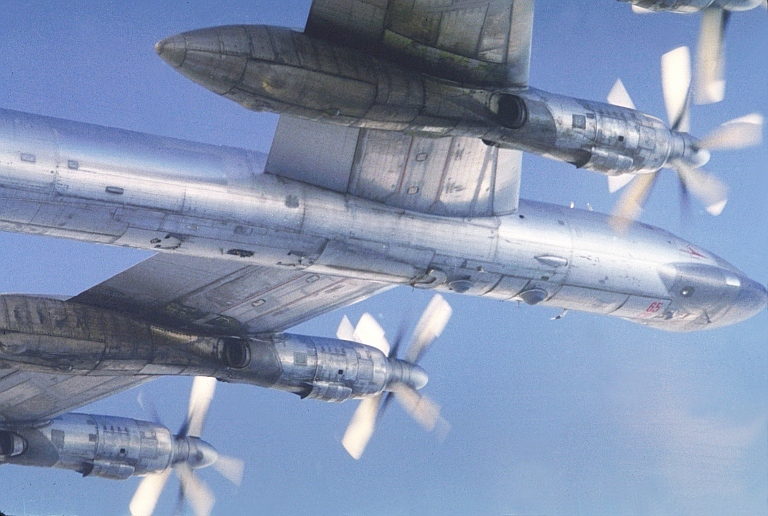 The Tu-95KM Bear C was an enhanced Bear B, with a pair of additional SRS-6 'Romb 4A' electronic support measures radomes added to the aft fuselage, to aid in target acquisition. Late configuration Bear B/C were typically equipped with PRS-4 Kripton 'Box Tail' tail warning radars, RSB-70, RSIU-5 radios, ARK-11 ADF, RV-UM and PV-17 radio altimeters, KS-6D heading reference, RPB-3 Tucha weather radar, SPS-3 jammer and SPO-3 Sirena warning receiver. The next evolution in the Tu-95 Bear B/C line was the extensive block upgrade to the Tu-95K-22 Bear G configuration, replacing the Kh-20 with the much more capable supersonic Raduga Kh-22 Burya / AS-4 Kitchen [More ...], developed for the Blinder and Backfire bombers, and conceptually the Soviet equivalent to the RAF's Blue Steel [More ...]. 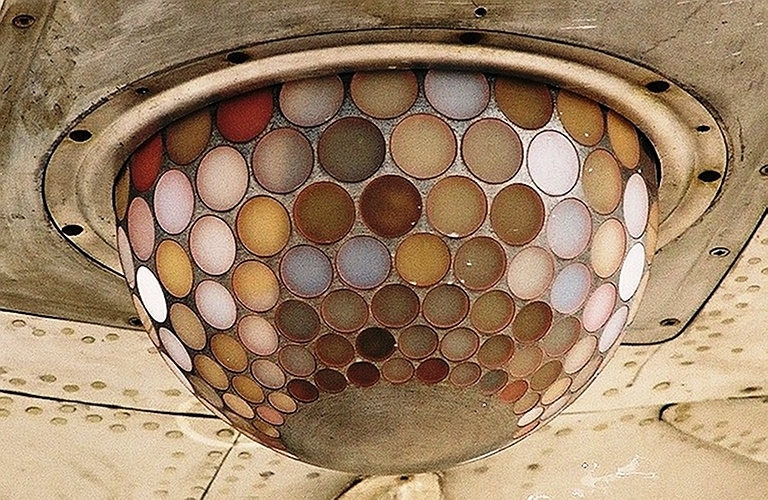 This upgrade was initiated during the early 1970s, and proved to be protracted and troublesome. The Tu-95K-22 Bear G is a rebuild of the 1960s Bear B/C, armed with the Kh-22 Kitchen / PNA-B Down Beat weapon system developed for the Tu-22M Backfire. Equipped with a comprehensive EW suite including a rebuilt tail housing the SPS-152/153 jammer, and armed with up to three supersonic Kh-22 cruise missiles, the Bear G was a potent capability in the latter years of the Cold War (US DoD). The Bear G was the most extensive upgrade package on any offensive Bear. The upgrade required addition of two inboard wing pylons each with a BD-45K launcher for the Kh-22 missile, and a rebuild of the bomb bay to accommodate a single Kh-22 on a BD-45F launcher displacing the Kh-20 semiconformal station. The Crown Drum attack radar was replaced with a variant of the Backfire's Leninetz Rubin PNA-B 'Down Beat'. The tail gunner's station was replaced with an extended tailcone fairing, mid fuselage and thimble nose radomes, which house emitters for the SPS-151/152/153 Lyutik self protection jammers, common to the MiG-25RBV and MiG-25BM Foxbat, and some Tu-16P Badger subtypes; and the aft fuselage blister radomes for the Kurs N/NM RHAW used to target anti-radiation variants of the Kh-22, ie Kh-22MR. Some sources also claim Rezeda-A / SPS-100A and SPS-140 Siren series jammers were also carried. While the Bear G program was initiated in 1973, the first live missile shot did not occur until 1981, and Russian sources claim 65 aircraft were rebuilt, with formal service acceptance in 1987. Soviet propaganda art depicting a flight of Bear G aircraft (via Tupolev). A Bear variant seldom discussed is the Tu-95M-5 which was armed with a pair of KSR-5 / AS-6 Kingfish supersonic anti-ship ASCMs at that time carried by the Tu-16K-26 Badger. This variant was equipped with the Rubin-1K radar used on the Tu-16K-26. It was abandoned in favour of the Bear G, as this missile had superior standoff range to the KSR-5. The final production strike variant of the Bear is the Tu-95MS Bear H, based on the improved Tu-142MK Bear F maritime patrol airframe variant. Development of the Bear H was initiated during the mid 1970s, in response to the US Air Force introducing the AGM-86B ALCM on the B-52 fleet. The Soviets initiated the development of the Kh-55/RKV-500 / AS-15 Kent cruise missile in 1976, and first trials were performed with a modified Tu-95M, labelled the Tu-95M-55, in 1978. The Tu-95MS Bear H is the last production strike variant, built until the early 1990s as a cruise missile carrier, armed with the Kh-55 Kent cruise missile. The Bear H is a key airborne component of Russia's nuclear triad, and is to acquire a conventional strike role akin to that of the US B-52H. 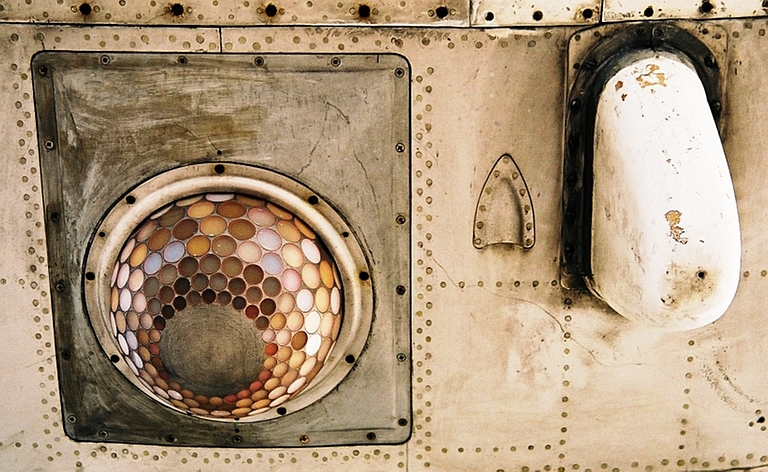 The Bear H airframe is based on the Bear F, but has a unique nose housing the Obzor MS attack radar (Ru MOD, US DoD). The Bear H is a substantially new design, suing 1980s techynology, and should have been designated in the Tu-142 rather than Tu-95 series. Other than the extensively revised airframe design, undercarriage and 15,000 SHP NK-12MP engines, the fuselage barbettes were removed but the tail gunner's station was retained with GSh-23 guns. The nose was resculpted again to situate a new attack radar, but retains the AAR probe of earlier models. With an MTOW of 187.75 tonnes, empty weight of 94.4 tonnes, and internal fuel capacity of 84 tonnes, the Bear H is firmly in the weight class of the B-52. The Tu-95MS is essentially a standoff cruise missile carrier, emulating the strategic role of the US B-52G/H. The fuselage bomb bay of the baseline Tu-95MS-6 variant is fitted with a SRPE MKU-5-6 rotary launcher for six Kh-55 family ALCMs. The enhanced Tu-95MS-16 carries an additional ten Kh-55 family ALCMs on external wing pylons. 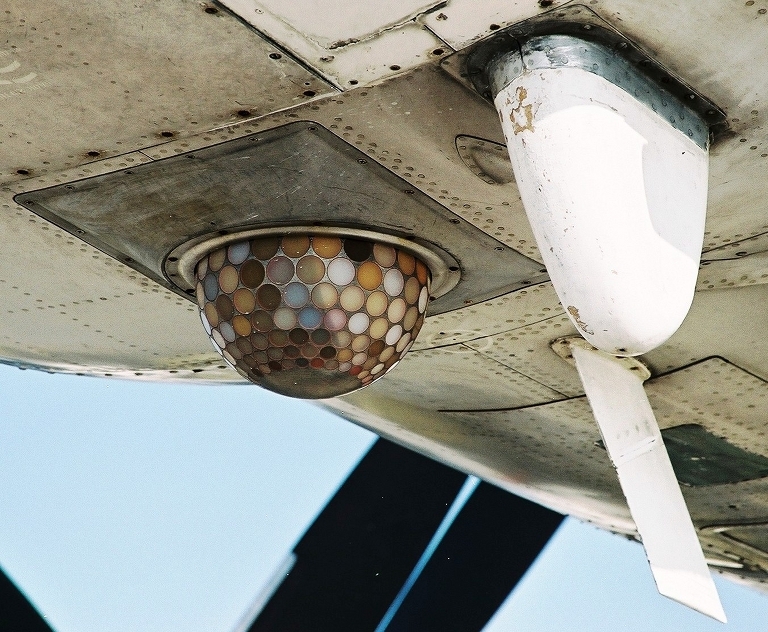 The Leninetz Obzor MS Clam Pipe radar was introduced on the Tu-95MS Bear H, and also the newer Tu-160 Blackjack. 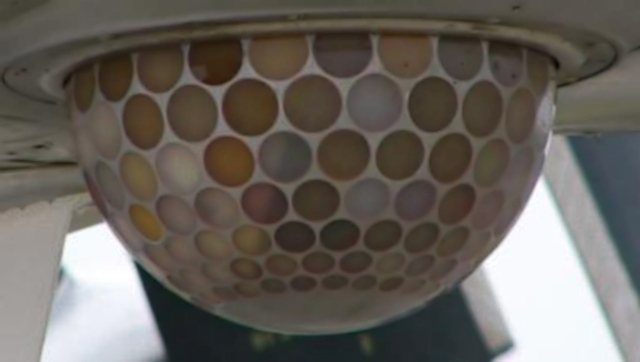 It is a nav/attack radar which is claimed to include LPI and SAR mapping capabilities in later variants (Leninetz). Azovsky MAK-UT Infra-Red Missile Approach Warning System (MAWS) carried by a Bear H.
The defensive avionic suite of the Bear H includes an SPS-160 Geran jammer, Azovsky MAK-UT IR Missile Approach Warning System, APP-50 chaff/flare dispensers and Avtomatika SPO-32 / L150 digital warning receiver, all integrated with a Meteor-NM EWSP controller. The offensive avionic suite is centred on the Leninetz Obzor-MS 'Clam Pipe' attack radar - advanced variants are claimed to have LPI (Low Probability of Interception) and SAR (Synthetic Aperture Radar) capabilities. Russian sources claim production of the Tu-95MS continued until 1992, with 84 Tu-95MS in the inventory during 1991, in addition to the remaining 63 Tu-95K-22, Tu-95K and Tu-95M. Since then, the Tu-95K-22 fleet has been progressively reduced by planned scrappings. An airframe with the prodigious range and endurance of the Bear was a natural candidate for intelligence, surveillance, reconnaissance (ISR), targeting and maritime patrol roles. Unlike the strike role, which saw only two major variants, one of which evolved through multiple subtypes, a multiplicity of surveillance, reconsaissance, intelligence gathering, targeting and maritime patrol variants were built. In a sense the common perception of the Bear as a 'bomber' does not reflect the reality that strike variants formed only a fraction of the total Bear construction. 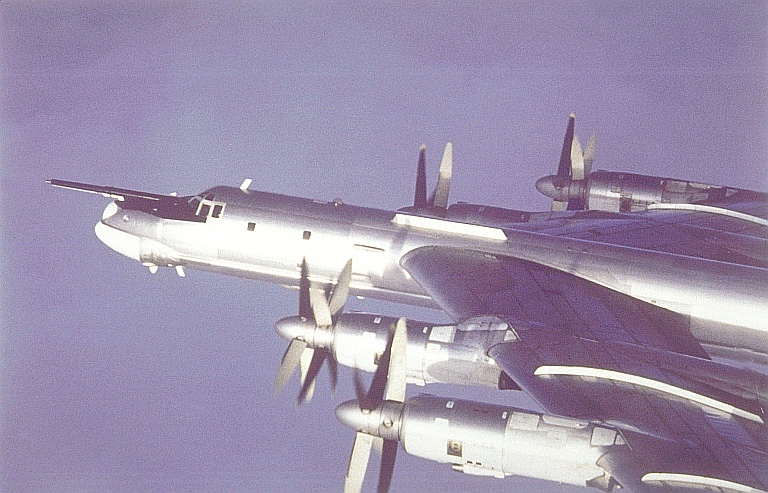 The first dedicated reconnaissance variant was the Tu-95MR Bear E, a dozen of which were converted from surplus Tu-95M Bear A bombers by the installation of a bulged reconnaissance pallet in the bomb bay. Equipped with an undisclosed package of 3 cameras, with no less than seven apertures in a large bomb bay arrangement, the Bear Es were used for maritime and strategic imagery intelligence gathering. The avionic package included SRS-6 Romb-4A', SRS-7 'Romb-4B' and SRS-1 ELINT receivers, variants of which were used on the Il-38 May, Tu-16SPS and MiG-25RB Foxbat. 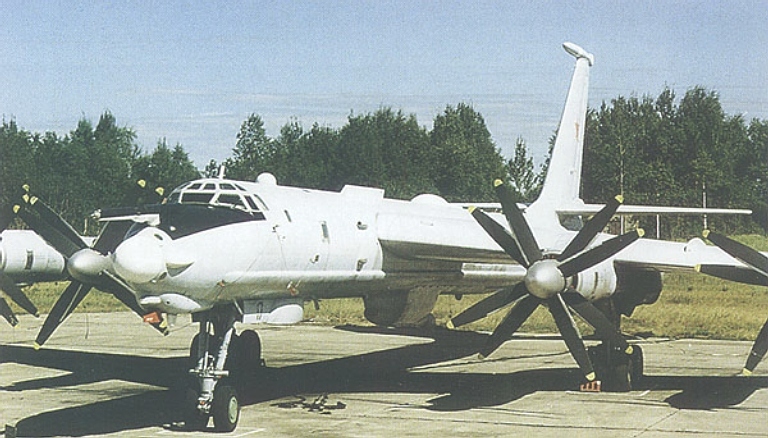 The Bear E fleet was progressively converted to trainers by the 1980s, as the newer Tu-142 LRMP and Tu-95RTs recce/targeting variants subsumed their role. A much more ambitious conversion was the maritime ISR and targeting variant designated the Tu-95RTs (Razvedchik - Tseleukazatel' = Reconnaissance - Targeting) or Bear D, which entered service in 1964 and was identified by Western intelligence in 1967. While the Bear D was derived from the Bear A airframe, it was extensively modified for this role and carried no offensive weapons, but retained the ventral barbette, tail guns and Box Tail tail warning radar. Some Bear Ds are also claimed to have had their tail turret replaced with a fairing housing the SPS-151 jammer in an arrangement similar to the Bear G.
The Bear D was equipped with passive and active targeting sensors intended to provide over-the-horizon targeting for submarine launched anti-shipping missiles. The passive detection suite included the SRS-6/7 'Romb 4' series ELINT receivers, Kvadrat ELINT analysis receiver in the aft bomb bay, and the Vishnia SIGINT receiver system, all used to locate and identify the radar and communications emissions of Western warships. The passive ELINT package was largely common with the dedicated Il-20 Coot-A electronic reconnaissance and intelligence gathering aircraft. The active sensor package was more ambitious and centred on the large Kvant Research Institute МЦРС-1 «Успех» / MTsRS-1 Uspekh-1A or 'Big Bulge' maritime search and targeting radar system, located in a large radome under a rebuilt bomb bay. The I/J band Uspekh-1A is credited with a range of about 215 NMI (400 km) against maritime surface targets, it was later replaced with the improved Uspekh-U. 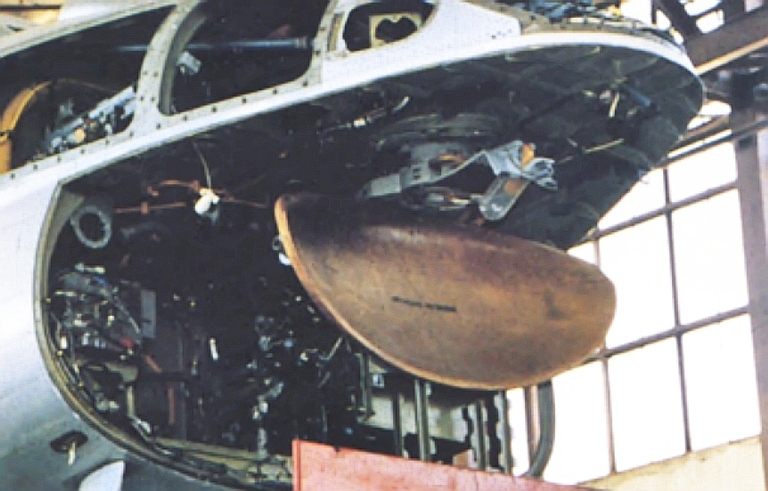 The Bear A's Short Horn attack radar was replaced with a steerable datalink antenna for missile guidance, under an ventral nose enlarged radome. 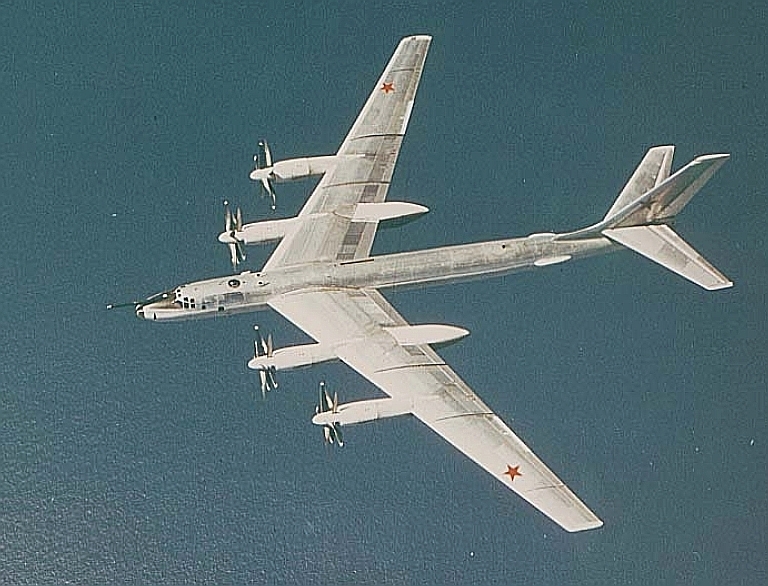 One of the most unique variants of the Bear was the Tu-95RTs Bear D, a maritime ISR and targeting variant designed to provide over the horizon targeting for Soviet warships and especially cruise missile armed submarines. The large Uspekh / Big Bulge targeting radar system relayed targeting imagery via a datalink to Echo II and Juliet submarines to target Shaddock and Sandbox ASCMs. The Bear D has been superceded by ocean reconnaissance satellites (US DoD). The Bear D would initially acquire its targets using its ESM receivers or the Big Bulge radar. Once acquired, the radar would initiate tracking to support the project 651 (Juliet SSG) and Project 675 (Echo 2 SSGN) submarines, armed respectively with 4 or 8 P-6 or SS-N-3 Shaddock anti-shipping cruise missiles. 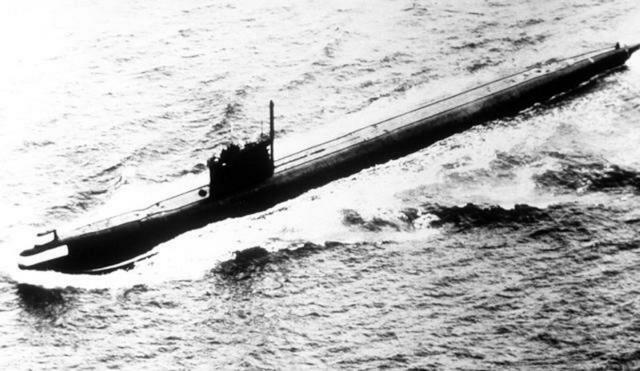 A typical engagement would see the submarines manoeuvre into position, and then surface to elevate their Shaddock launchers, and expose the Front Door and Front Piece F-band guidance antennas located in the forward fin. Once the Shaddocks were launched, they would receive midcourse command updates until they acquired the intended targets with their seekers and dived to impact. While the Russians have never disclosed details of the Uspekh-1A / Shaddock weapon system, we can surmise that the Bear D provided via datalink a situational picture to the SSG/SSGN CIC, and may have also provided midcourse command link updates for the Shaddocks in flight once they passed beyond the datalink horizon of the launching submarine. By the 1970s the Shaddock was being progressively replaced with the supersonic liquid rocket P-350/P-500 4M-77/4M-80 Bazalt or SS-N-12 Sandbox system, carried by Slava and Kiev cruisers, and 10 of the Echo II SSGNs. The latter were equipped with variants of the Kasatka-B datalink system to interface with the Uspekh radar on the Bear D. Open sources are unclear as to whether later weapons such as the P-700 Granit or SS-N-19 'Shipwreck' carried by the Oscar II class SSGNs can be targeted or midcourse guided by the Uspekh system. Given the Soviet penchant for backward compatibility, this cannot be ruled out. 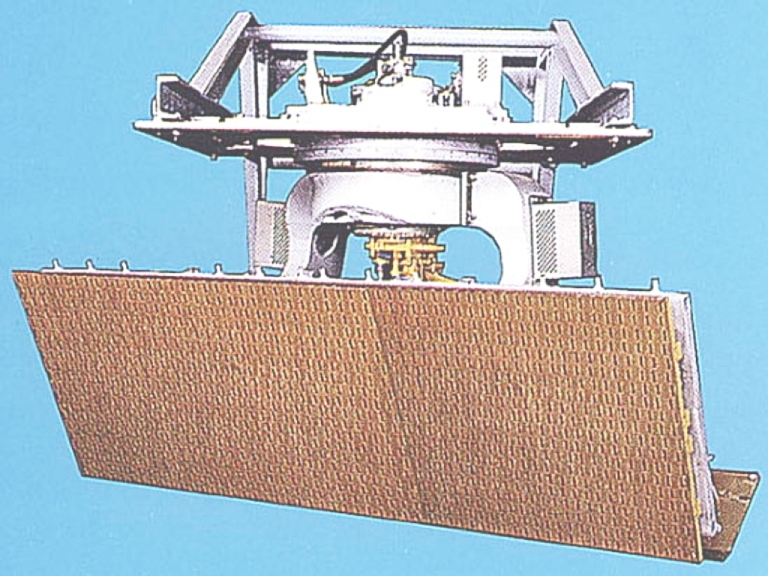 The Bear D's targeting function was eventually subsumed by the RORSAT orbital reconnaissance and targeting system, which employed a Molniya satellite link for the Sistema Morskoi Kosmicheskoi Razvedki i Tselkazaniya (SMKRITs). A variant of the Tu-142M was trialled as a replacement for the Bear D.
Upper - Echo SSGN; lower Shaddock launch. The Tu-142M Bear F is Russia's premier LRMP aircraft, larger, faster and longer ranging than the P-3C Orion, and typically armed with heavier ASW weapons and a larger sonobuoy payload. India is the sole export client for the Bear F, operating at least eight aircraft. Indian Bears were to be provided with a comprehensive avionic upgrade and most likely BrahMos supersonic cruise missiles, but that is now in doubt (US DoD). The Sea Dragon LRMP avionic suite intended for upgrades on the Tu-142M Bear F includes a new low sidelobe X-band planar array surface search radar (lower), replacing the legacy Korshun series radars (Leninets). 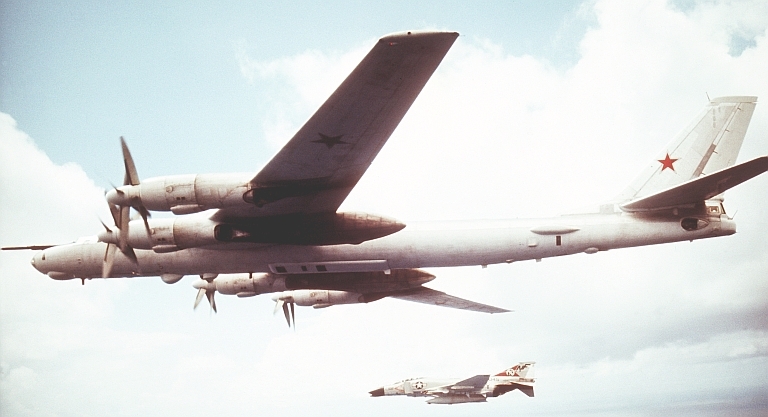 The Tu-142 Bear F Long Range Maritime Patrol (LRMP) aircraft was introduced into service in 1972, and incorporates significant design changes, including integral wing tanks rather than bladders, an extended forward fuselage, an extended-chord rudder, improved undercarriage, but retaining the 'classic' glazed nose of the Bear A. The Bear F is a 'bigger and better' P-3 in its role, and is equipped with a comprehensive ASW/ASuW avionic suite. It's large size and endurance makes it unusually potent in the LRMP and ASW roles, as it can outrange and outstay smaller airframes. Four unique variants exist, the Tu-142 Bear F Mod.1, the Tu-142M Bear F Mod.2, the Tu-142MK Bear F Mod.3 and Tu-142MZ Bear F Mod.4. A single Tu-142MRTs, a variant intended to replace the Bear D, was trialled with the Uspekh-1AV system during the 1980s, but it was abandoned in favour of the Sistema Morskoi Kosmicheskoi Razvedki i Tselkazaniya (SMKRITs) satellite system. The Tu-142M Bear F Mod.2 variant introduced the Leninets Korshun surface search radar, later replaced with the improved Korshun-K in the Mod.3 and Korshun-KN-N in the Mod.4, both types replacing the earlier Leninets Berkut-95 radar common to the Il-38 May the baseline Tu-142. The Tu-142M also introduced the Pingvin thermal imager, the Visla-2 towed MAD sensor, a infrared tracker and a diesel fume sniffer, with the NPK-142M navigation suite. The Tu-142MK Bear F Mod.3 added the MMS-106 Ladoga MAD boom on the vertical stabiliser. 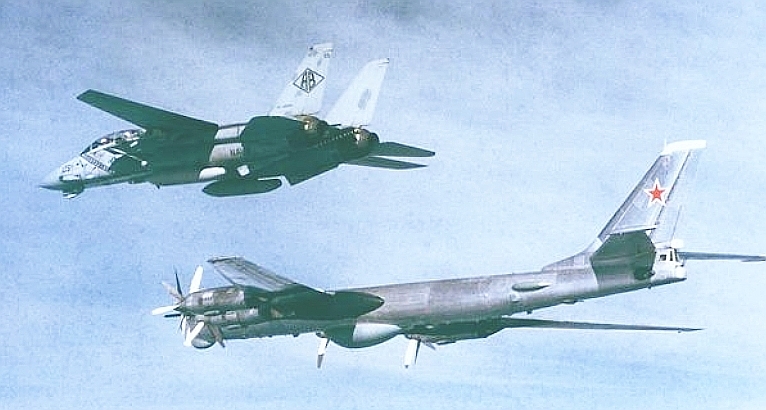 The Tu-142MZ Bear F Mod.4 added an upgraded Zarech acoustic system, NK-12MP engines, GSh-23 guns adopted from the Backfire, an improved EW suite, improved AAR equipment and some were fitted with enlarged weapon bays - the Tu-142MZ Bear F Mod.4 entered service in 1993. The last Bear to leave the Taganrog production line was a Tu-142MZ in 1994. The Bear F is equipped with a sonobuoy bay for up to 176 buoys, typically the RGB-15, RGB-25, RGB-55A and RGB-75 buoys, and can carry up to 12 torpedoes, FAB 250 dumb bombs and PLAB-250-120 depth charges. Weapon types cited include the AT-1M 450mm torpedo, the AT-2M 533mm torpedo, the UMGT-1 400 mm antisubmarine torpedo, and the rocket propelled APR-1, APR-2 and APR-3 ASW missiles. India remains currently the sole export client, with at least 8 Tu-142ME/MKE aircraft in service, introduced in 1988. EU sources indicate that an upgrade program for Russian Bear Fs to Tu-142MN configuration was planned, including a new Leninets core avionic suite, including the Leninets Morskaya Zmeya (Sea Snake) radar claimed to have an AMTI (Air Moving Target Indicator ie AEW&C) capability, and eight pylon stations for either Kh-35U Kharpunski missiles, or Kh-61 Yakhont supersonic missiles. If the latter does proceed the Bear F's role would expand from LRMP/ASW to encompass ASuW, following Western practice. 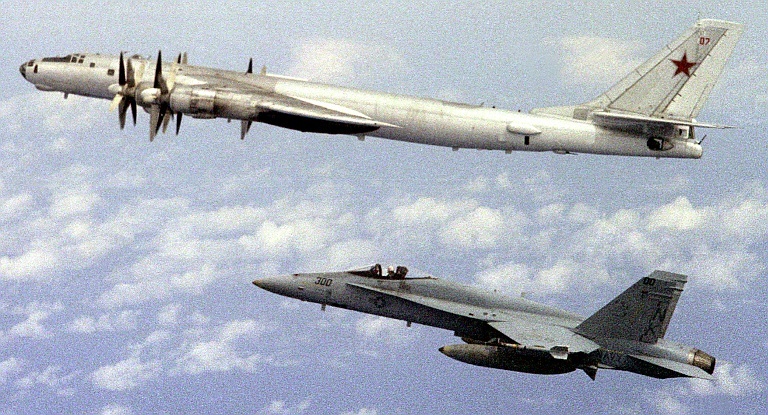 The Tu-142MR 'Orel' Bear J is the final major variant of the Bear and is a VLF band radio communications relay similar in concept to the US E-6A TACAMO. It provides a communications relay capability to submerged SSBNs, SSGNs and SSNs. The Bear J is based on the Bear F airframe but has unique systems. The ventral fairing contains the VLF antenna cable reel, also note the unique nose radome and antenna on the vertical tail. The Tu-142MR Bear J is Russia's TACAMO, used to relay messages via a VLF radio link to submerged submarines. 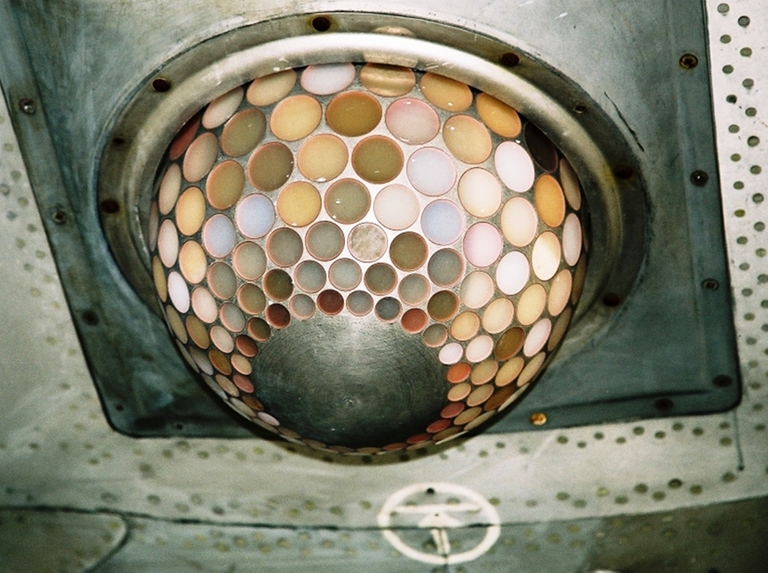 Note the large ventral housing for the trailing VLF antenna reel, the dorsal satcom blisters and the unique nose antenna suite (via Russkaya Sila, US DoD). All images © Miroslav Gyűrösi. Imagery Sources: US DoD; Tupolev; VVS/AVMF; other Internet sources.